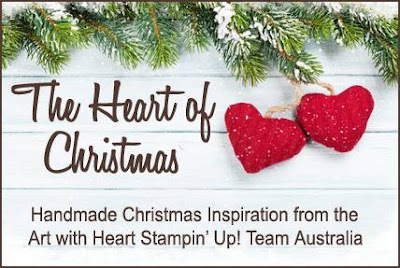 Hi everyone and welcome to week 17 of Christmas inspiration with Art with Heart Stampin'Up Team Australia. For todays card base I used Marina Mist, for the first mat I used Champagne Foil Sheet (mmm doesn't seem to show up in the picture, but its there lol) and once again I used vellum and embossed it using the Winter Wonder Textured Embossing Folder, I adhered that to the top of the card using Tear Tape and covered that with the Quilted Christmas Ribbon (one of my favs, I always go to this one). For the mittens I used the 2nd smallest Stitched Oval and cut out 2 mittens from the Red Glimmer Paper and 1 from Dazzling Diamonds which I cut some of at each end and adhered them with some glue dots and a little tombo, I cut 2 pieces of Dazzling Diamond from the smallest Stitched Framelit for the thumbs again using some glue dots and a little tombo to glue behind the mitten. 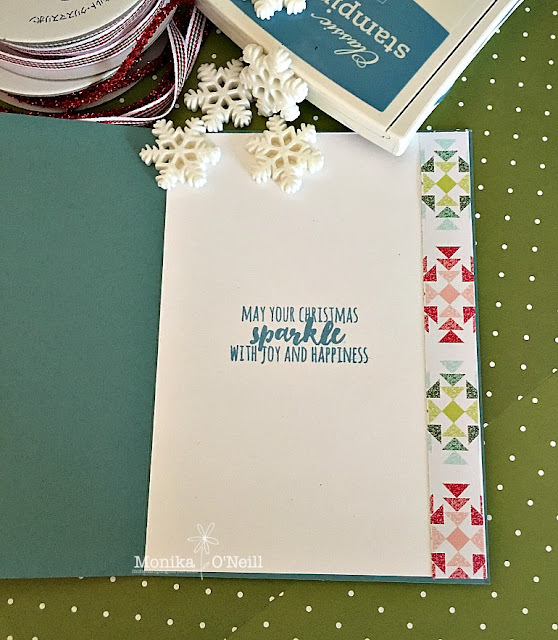 For the cuffs I used the second smallest Scalloped Square from the Quilted Christmas DSP folded that in half and trimmed it a bit smaller, to finish the mittens off I cut 2 small snowflakes from Dazzling Diamonds using The Seasonal Layer Thinlets (this set is so versatile one I use for all seasons) For the front sentiment and inside of the card I used the Christmas Pines Stamp Set using Marina Mist Ink. 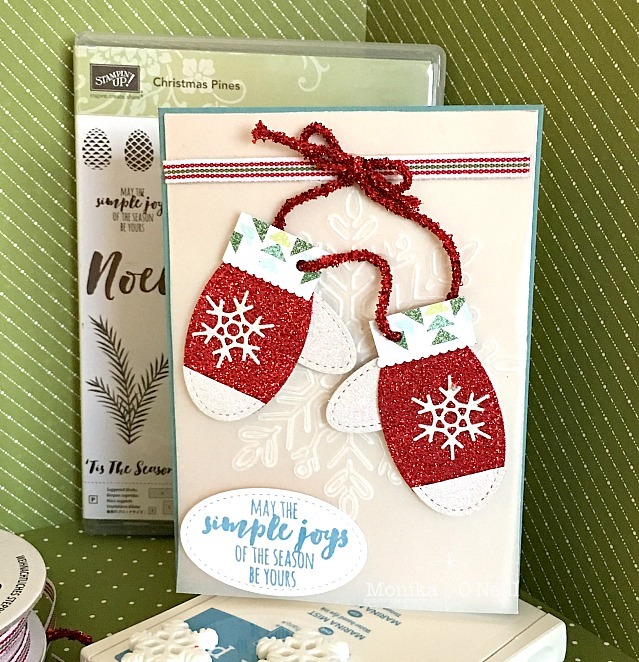 I tied the mittens together using the Red mini Tinsel Trim. Hope you enjoyed this weeks card. To see more beautiful inspiration from our very talented ladies you can view all our participants on the lovely Claire Daly’s blog . Have a great week and will see you again next week with some more great cards.